The long-running, critically-acclaimed series that inspired the hit TV show just keeps drawing in readers with every new story arc. 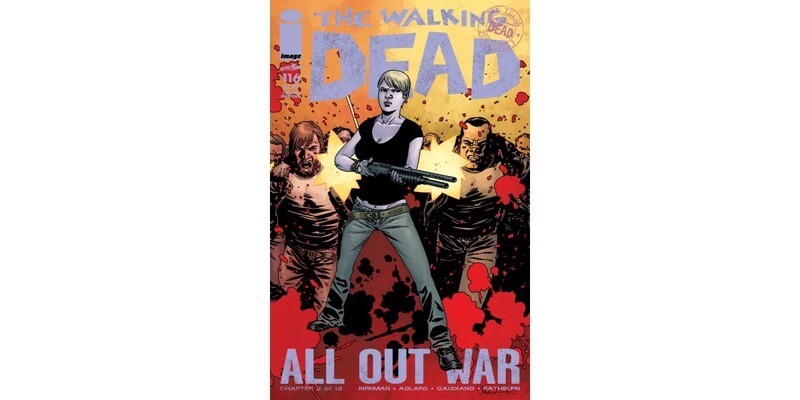 ALL OUT WAR explodes in THE WALKING DEAD #116, by creator Robert Kirkman and artist Charlie Adlard, when the first shots are fired between Rick's army and Negan's Saviors. Fans of the TV show who were left hanging on the mid-season finale can jump into the comic series' action as it picks up momentum. Image Comics is committed to keeping all issues of THE WALKING DEAD: ALL OUT WAR available, and is pleased to announce that THE WALKING DEAD #116 will be going back to print to meet customer demand. The second printing will release on 1/8/14 and will be available for order with Diamond Code OCT138242. THE WALKING DEAD #115 2nd printing, featuring a stunning gatefold cover, is still available in stores and can be ordered with Diamond Code AUG138407.